The Korg microKorg synthesizer has the advanced features and state of the art sounds to give your songs the professional edge. $439.94 Seen a lower price? State-of-the-art analog modeling and multi-band vocoding are finally available in a compact, portable instrument. With 37 keys and 128 user-rewritable programs, the MicroKORG Synthesizer/Vocoder is perfect for the performer, producer, computer musician, or beginner looking for an affordable synthesizer. The MicroKORG delivers the quality sounds and features you expect from Korg at a price that will astound you. The microKORG boasts the same dual-oscillator DSP synthesis engine found in Korg's critically acclaimed MS2000 and offers a wider selection of waveforms than any other modeled synth. Oscillator 1 features a total of 71 waveforms. These include traditional analog waves like saw, pulse, sine, and noise, plus more unique choices like Vox wave and cross wave. Together they provide a cool selection that can be modulated to produce an extensive range of timbres. In addition, 64 exclusive DWGS waveforms from Korg's classic DW-8000 enable the microKORG to reproduce a broad collection of imitative sounds. Sounds like bells, electric pianos, guitars, basses, and more that would be difficult reproduce on an analog synthesizer. You can also apply Ring and Sync modulation from Oscillator 2 to create the kind of complex timbres that are the true sign of an advanced synthesizer. Four filter modes are available, offering -12 dB (2-pole) low pass, high pass, and band pass configurations plus an extra steep -24 dB (4-pole) low pass setting. All include resonance. Two classic ADSR envelope generators and 2 MIDI-syncable LFOs provide the power to shape your sounds. Add a Virtual Patch matrix that lets you create advanced modulation settings - routing the Mod Wheel to control filter cutoff or pulse width, using an LFO to control panning or amp level, etc. - and you have performance that is unheard of from a synthesizer in this price range! 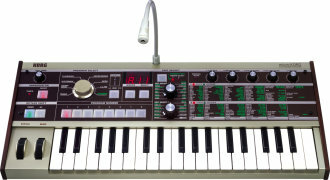 The microKORG includes an 8-band vocoder with many advanced features. You can capture and "freeze" the formants of your voice, and then play it across the keyboard, or shift the formant frequency to make your voice sound male, female, like a child, or just plain wacky! 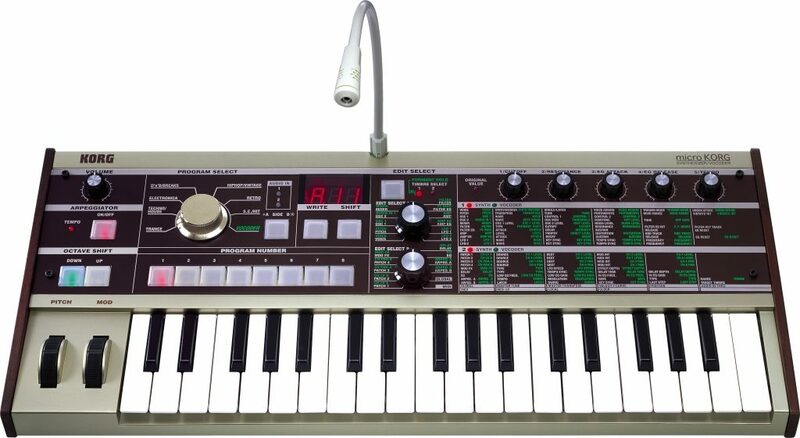 Best of all, the microKORG comes with its own microphone so you can start having fun right away. Three types of modulation effects (chorus/flanger, phaser, ensemble), 3 types of delay effects (stereo, cross, L/R), and a 2-band equalizer add the finishing touch to the microKORG. The delays can be synchronized with the arpeggiator or to an external MIDI clock - a great feature for live performances or for laying down tracks. All effects can be edited to create your own, unique sounds. Korg has used all of the microKorg's synthesis power in the creation of 128 great-sounding presets. They cover a wide range of musical styles plus many vintage favorites. Sixteen vocoder Programs are also included. The Pitch Bend wheel, Modulation wheel, and 5 other knobs provide flexible realtime control over filter cutoff, attack, release, and other important parameters. The Edit Mode allows you to fully edit the existing sounds, or to create your own ones. Two external audio input jacks are provided, so you can run other instruments, CDs, and more through the microKORG's filter and effects, allowing you to process sounds in truly creative ways. The microKORG's compact size is perfect for the musician or DJ looking to add a synth to his or her setup when space is tight. It's also a great choice for use in a computer-based music setup. The 5 real-time knobs on the front panel can transmit MIDI messages (control changes), so they can be used as controllers for software synthesizers. Use the 37-note velocity-sensitive mini-keyboard for controlling other gear or for recording and editing with your sequencer. And thanks to battery-power, the microKORG is the ultimate portable controller when used with a laptop computer!